Paper Smooches is having a contest for National Scrapbook Day and I decided to join in. 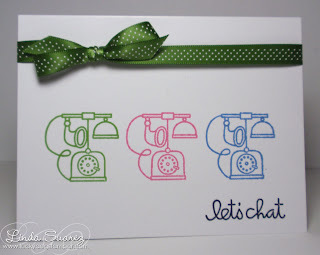 I recently got a few stamp sets from Paper Smooches when my local scrapbook store started carrying them. They are such fun stamps. I know I will be adding to small collection. I used Perpetual Bliss to make this simple, one layer card. I like the old-fashioned telephone. While I was stamping it in a few different colors to see which one I wanted to use, I couldn't decide so I used green, pink and blue. Hi Linda! Was that you who won the big prize on Nichole's blog? If so, BIG CONGRATS!!!! Yes it was me! I'm super excited! Thanks!